hacked 2 of the 3 textures and UVs into one. hacked up the models hips/pelvic/thigh areas to compensate for the horrendous hips/thigh outward warpage in the female skeletal model in game (you can see what I had to do to the model in the player select pic). Last edited by bigfoot_pi on Sat Mar 16, 2019 2:34 am, edited 3 times in total. Dude, you're on fire! Great releases, much appreciated. 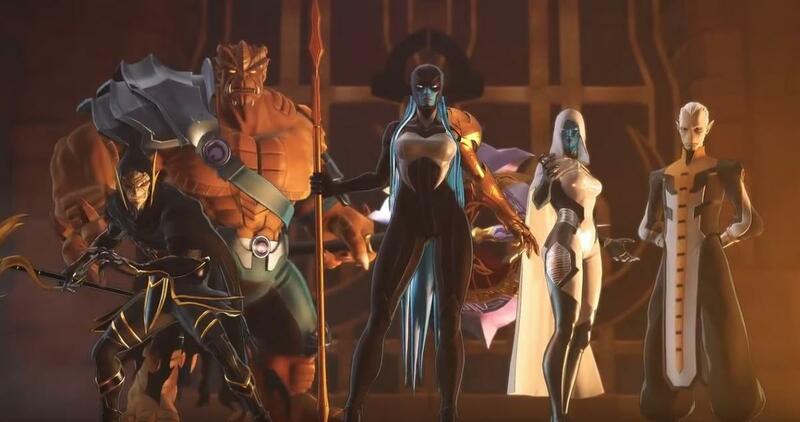 Any chance for a Proxima Midnight model? 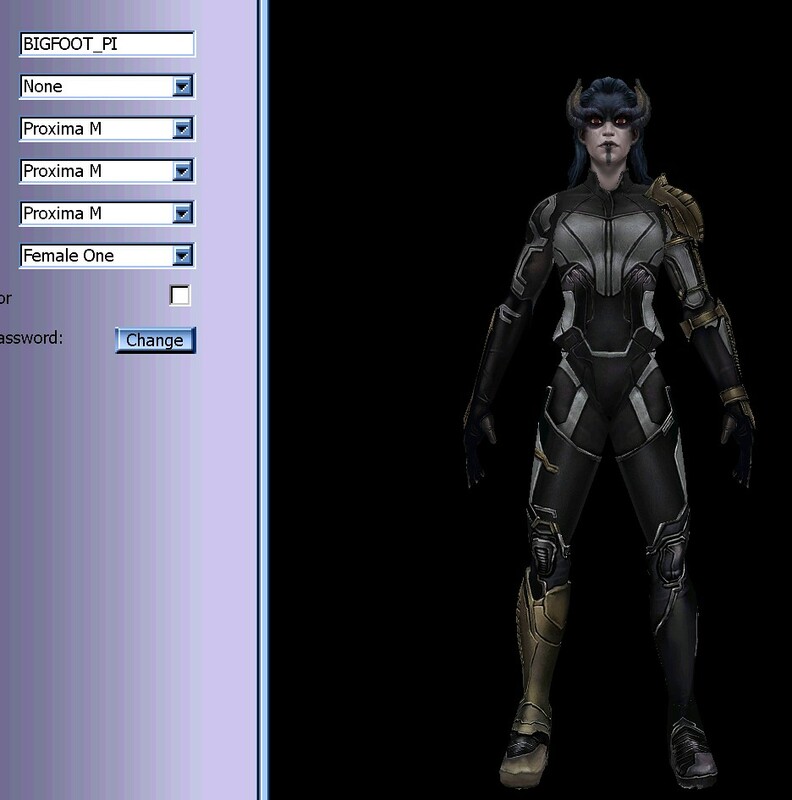 I mean, the real Proxima Midnight. bigfoot_pi wrote: Not sure why but has male death and hitsounds. female taunts and acks. if someone knows how to fix that let me know. I assume its something in the skeletal system or class files. not sure. this may be the only female I ever do if its gonna be such a mess. The ProximaM Player and Bot are subclasses of the SkeletalChars's SkeletalPlayer and SkeletalBot respectively, so they inherit the properties of those classes - the SkeletalChars's Player/Bot have male death/hit/etc sounds (apart from footsteps) and so these are inherited (as the male voice would have been except that this has been changed to a female voice in the default properties). 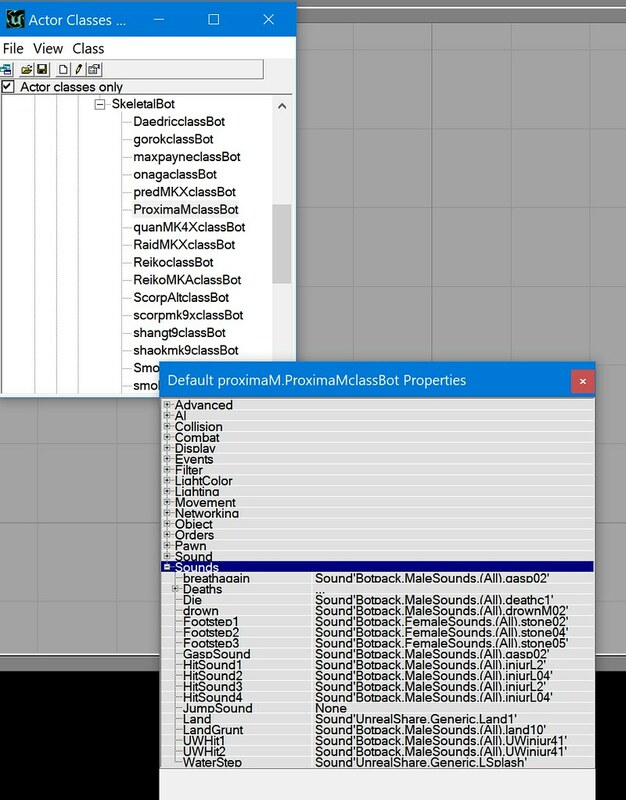 I think it is simply a matter of changing the male sounds to female sounds in the Sounds section of the default properties of the ProximaM Player and Bot. Last edited by OjitroC on Fri Mar 15, 2019 7:27 pm, edited 1 time in total. first off, it's a fine looking model. secondly, you should have considered not to release it untill it's working as you'd liked it to work. There are some people who just dump all files they can get their hands on regardless of quality and such. The voices should be fixed, and when/if that happens the model will come in two versions, one with working sounds and one with bad sounds. The dude with the file vault can't tell you which is what, he/she never uses stuff, just DL and up it again. So, your work risks to be rendered useless in the future if this version is used over a fixed version? where are those default properties at? how do i access them? looks fine. what else should i look for and where? Highlight it and right click, in the dialog that comes up click on Default Properties - Sounds are at the bottom. You can then change the sounds by going to the Sounds Browser and opening FemaleSounds.uax (if it isn't already in the list of sounds). To change the sound for Die, for example, highlight the female sound you want to use (say 'death1d') and in the Default Properties, click to the far right of Die - two buttons should come up, Clear and Use - click on Use and 'death1d' should appear in the box. You can change as many of the sounds as you want. Don't forget to expand Deaths and change the sounds there as well. Do the same for the ProximaM Player by going to Pawn -> PlayerPawn -> TournamentPlayer -> SkeletalPlayer -> ProximaMClass in the Actor Class tree. Having changed the sounds, save the ProximaM.u file (tick the box to the left of the ProximaM.u in the Packages pane and click on Save). Hope that's clear - should be once you open up the Class in UEd. PM me if you need further guidance. Last edited by OjitroC on Sat Mar 16, 2019 12:45 am, edited 3 times in total. OjitroC wrote: Fire up the UT Editor (UEd) - open the Actor Class Browser - open the ProximaM.u - to locate the ProximaM Bot in the Actor Classes 'tree', go to Pawn and then click on Bot -> HumanPlusBot -> SkeletalBot -> ProximaMClassBot - highlight it and right click, in the dialog that comes up click on Default Properties - Sounds are at the bottom. You can then change the sounds by going to the Sounds Browser and opening FemaleSounds.uax (if it isn't already in the list of sounds). To change the sound for Die, for example, highlight the female sound you want to use (say 'death1d') and in the Default Properties, click to the far right of Die - two buttons should come up, Clear and Use - click on Use and 'death1d' should appear in the box. You can change as many of the sounds as you want. ...Do the same for the ProximaM Player by going to Pawn -> PlayerPawn -> TournamentPlayer -> SkeletalPlayer -> ProximaMClass in the Actor Class tree. Having changed the sounds, save the ProximaM.u file. I've added screen shots which should make the instructions a bit clearer. The issue in the other thread is the same as the one with your model because the SkeletalChars classes use male sounds and, like I say, these need to be replaced.